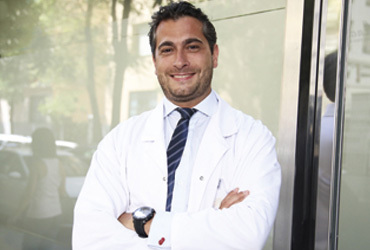 Dr Álvaro Sáez-Arenillas Martín completed his Bachelor of Medicine and Surgery at the prestigious University of Salamanca, graduating at the top of his class and obtaining the speciality in Orthopaedic Surgery and Traumatology from the University Teaching Hospital of San Carlos, associated with the Complutense University of Madrid. The same year in 2008, his academic excellence led him to receive an exceptional score on the MIR exam and to accredit his Research Aptitude (DEA) in Orthopaedic Surgery and Traumatology. He was immediately appointed (and continues to this day) to be an Honorary Collaborator in the Department of Surgery at the Complutense University of Madrid, as well as an Evaluator of the Objective Structured Clinical Evaluation Exam for 6th year medical students. He has provided his services in major hospital institutions in Madrid, such as the University Hospital La Paz and the Niño Jesús University Children’s Hospital, along with the Estévez Institute of Traumatology of the Nuestra Señora de América Clinic. Member of the Illustrious Official College of Physicians of Madrid, he combines his work as a surgeon at the Clinic Santa Elena in Madrid and at the Valles Sanatorium in Alcalá de Henares with his work as Clinical Assistant Director of Solcot in Madrid and as the coordinator of the Traumatology Department at the Recoletas Cuenca Hospital. Dr Sáez-Arenillas also collaborates by giving numerous talks and presentations at conferences, along with his many publications and his strict ongoing education.